All four precious metals (gold, silver, platinum and palladium) made gains in August, thanks to industrial factors and safe-haven demand. We don’t know what will happen with the US debt ceiling, increasingly overvalued stocks (the NASDAQ and the S&P500), Trump’s plans for corporate tax, and dealings with North Korea and Venezuela. We are living in uncertain times, and investors have allocated funds to the ultimate safe havens – precious metals. Gold rose to its highest point in 2017 as tensions between the US and North Korea ramped up. In August, the price rose 3.59%. Silver was also up due to safe haven demand, but its 5% climb was also partly due to manufacturing demand. Gold’s rise is partly due to demand from countries like China and India, but it has primarily been driven by desire in the West to own a safe haven (because of North Korea, Venezuela, the Middle East, the Trump administration). 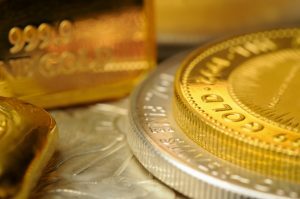 In the long term, investors will look to gold and silver as they begin to price risk into the market. There is concern over market complacency, and financial organizations are warning about overpriced equity markets and lack of perceived risk. There is an expected climb in demand from China. China’s pricing of assets in yuan, and its plan to sell yuan-priced physical gold contracts, could allow them to trade outside of the US banking system. Platinum’s most recent surge is likely because of further sanctions being placed on Russia by the US. Russia is the world’s second-largest producer of the metal. Precious metals are climbing because perceived risk in the political and financial system is climbing. There is an overvalued stock market and a US president who cannot get his people together. This means that the US government could come to a grinding halt over the debt ceiling issue. These issues have not been priced into the markets. They likely will be in the coming months, and then the safe-haven role of precious metals, and gold in particular, will come into its own. Why is NUGT currently 43 with gold at 1350/ounce when Sept 2016 it was at 99 with gold at 1350. Doesn’t make sense. This is taking into account the reverse 1 for 4 split. While we don’t provide advice or insight into stocks, generally speaking, holding an ETF is not the same thing as holding gold bullion. In this case, NUGT appears to be a 3x leveraged ETF, even further removed from the experience of holding gold in a secure, segregated, and insured manner. Generally, as the SEC and many other regulatory agencies and analysts have emphasized over the years, ETF exposures should be held for short periods of time, typically not over a weekend or significant or related futures and/or options rollover dates. If you wish to be in touch with us regarding the process of purchasing true gold, silver, and platinum bullion it would be our pleasure to serve you. Please call us Toll Free at 1-888-474-1001, or directly 905-415-1001. Thanks, you are correct and I am aware of the risk of NUGT. What I don’t know is the reason for the price discrepancy. If there is a DIRECT correlation between the NUGT ETF and the price of gold, NUGT should have gone back up to 99. It essentially says the price of NUGT goes down a lot faster than it goes up for the equivalent movement in gold. I find this disturbing.